Be careful what you think. You may get what you wish. The power of the placebo and nocebo are remarkable and often overlooked in medicine. With a placebo, severe chest pain disappears with mock surgery, Parkinson’s tremors stop, knee pain is eliminated following mock arthroscopic knee surgery and even of lymphosarcoma can be affected (Beecher, 1961; Benedeteti, 2007; Moseley et al, 2002; Kirkley et al., 2008; Klopfer, 1957; Moerman & Jonas, 2002). On the other hand, nocebo can increase pain, accelerate cancer growth, and cause death (Cannon, 1942; Klopfer, 1957; Benedeteti, 2007). These are demonstrations of the self-healing and non-healing potential intrinsic within each of us. The placebo response (from Latin, “I shall please”) is the beneficial physiological or psychological effect that results from the administration of an otherwise ineffective or inert substance, procedure, instruction. and/or environment. 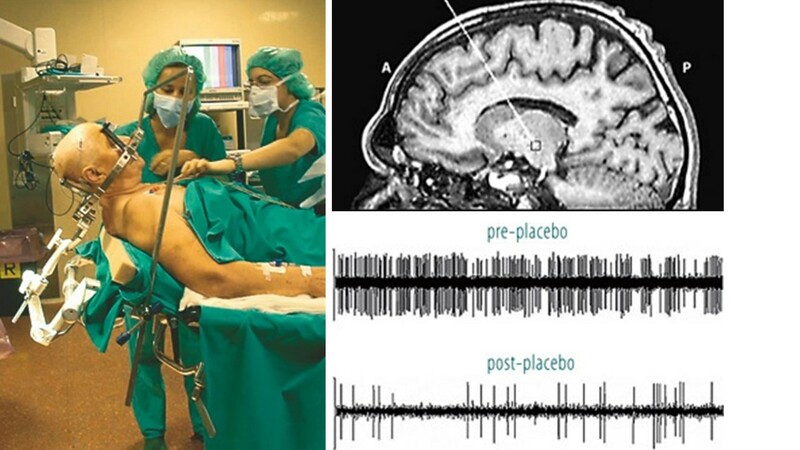 An example of placebo on neuron activity is demonstrated with a patient who has Parkinson’s disease (see figure 1). Figure 1. Recording the activity of single neurons from the brain of an awake patient suffering from Parkinson’s disease. Both the recording apparatus (a) and the electrode track (b) can be seen. In (c), the activity of a single neuron in the subthalamic nucleus can be seen before and after placebo administration (reproduced from: Benedeteti, F.(2007). The Placebo and Nocebo Effect: How the Therapist’s Words Act on the Patient’s Brain. Karger Gazette, 69). The nocebo response (from Latin, “I will harm”) may evoke the non-healing process and reactivate symptom/disease producing process and experiences. The nocebo response can be evoked by ineffective or inert substances, procedures, instructions, and internal and external environments which by themselves have no known effects. The placebo/nocebo response is modulated by our covert cultural, familial and personal beliefs, limitations and expectations. The placebo/nocebo effects are the actual demonstrations that the limits of our beliefs are the limits of our possibilities. This process is well described in the recent published book, You are the Placebo: Making Your Mind Matter, by Chiropractor Joe Dispenza. Dr. Dispenza describes the classic studies of placebo, mental processes and possible mechanisms by which placebo effects occur and disappears and how our thoughts and expectancies create our reality. The placebo transforms the inner beliefs and give the person the experience of improved health which transforms beliefs. In many cases we can experience improvement but are pulled back into our previous beliefs and self-images of illness by inner and outer cues which are associated with disease process. The book describes of the covert conditioning process by which we return to our old self and may maintain illness. It is challenging to maintain new beliefs and act/think in new patterns. The internal mental chatter and doubts flood our awareness. Even the question, “How long will the improvement last?” re-evokes the associative mental conditioned disease patterns. If it is possible to interrupt and transform our thoughts moment by moment, minute by minute, hour by hour, day by day and not just for 15 minutes of practice, remarkable changes are sometimes possible. Every thought that triggers an association of the illness state needs to be interrupted and redirected. When patients somehow transform their thoughts, it may result in reversing and eliminating illnesses such as polyostotic fibrous dysphasia, Hashimot’sthyroiditis or chronic lympocytic thyroiditis, and secondary progressive multiple sclerosis. I highly recommend this book for its outstanding description of placebo/nocebo and cognitive a model of the conditioning processes that underlie it. The book offers hope and inspiration for many patients who accept “what is/was” and are open to the present and future possibilities without judgement. The major limitation of the book is the absence of data; namely, what percentage of the patients/participants who have practiced Dispenza’s techniques have actually benefited and transformed their illness? The book would be more useful if it included both successful and the many unsuccessful cases. This would help patients who do the practices and do not improve. These patients sometimes blame themselves and failed at their self-healing—a process that increases depression and hopelessness. We need to realize that many factors affecting our health and illness are beyond our control. Although I agree with Dr. Dspenza’s basic premise that our beliefs, acceptance of what is and being open to the present and future supports healing. This perspective is only part of the whole picture. Health and illness are multi-factorial and many factors are not within our control. Beecher, H.K. (1961). Surgery as Placebo. JAMA, 176(13), 1102-1107. Benedeteti, F. (2007). The Placebo and Nocebo Effect: How the Therapist’s Words Act on the Patient’s Brain. Karger Gazette, 69. Cannon, W. B. (1942). “Voodoo” death. American Anthropologist, 44(2), 169-181. Dispenza, J. (2014). 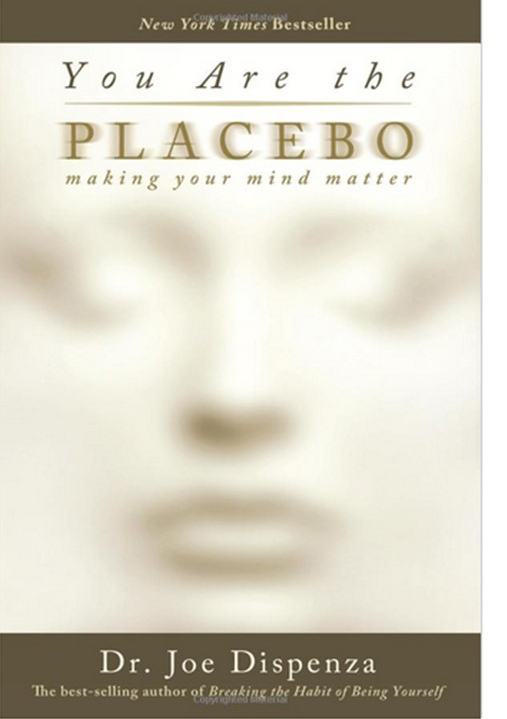 You are the Placebo: Making Your Mind Matter. Hay House, Inc.
Klopfer, B. (1957). Psychological Variables in Human Cancer. Journal of Projective Techniques, 21, (4), 331–340. Moerman, D.E., & Jonas, W.B. (2002). Deconstructing the Placebo Effect and Finding the Meaning Response. Annals of Internal Medicine. 136 (6), 471-476. Moseley, J.B., et al, (2002). A controlled trial of arthroscopic surgery for osteoarthritis of the knee. New England Journal of Medicine. 347(2), 81-88. While I am a definite believer in the power of placebo, the two reservations expressed by the reviewer above destroy a significant amount of the scientific credibility of this book: the appeal to quantum pseudo-science, and the lack of any data concerning success rates. While the book may be interesting and inspirational, these deficits empty it of real significance.